So, I have a mondo post in draft, which is close to being done...but not quite there yet. But something else came up that I'd like to quickly post about, because it combines a few things that are really important to me right now, and also gives me an excuse to link to a really awesome, new (to me) blog that is becoming one of my favorite spots on the interwebs these days. If I sound a bit like I'm gushing, it's because I am. Now, I'm not Jewish, and I don't watch The Big Bang Theory, but I did watch Blossom growing up, I am an academic (and being a PhD in Neuroscience, arguably so is she), and most importantly in this case, I am also a new mother who takes her faith very seriously. And by the way, Orthodox Christianity and Judaism share many of the same values, not to mention thousands of years of history and tradition (leading up to Christ). So, while Mayim and I don't agree about who Jesus Christ is, there is more common ground between us than one may initially think. Which is to say, her blog covers a lot of topics that are important to me right now, having to do with faith, family and work life. So, I am likely to link to it here from time to time...like I'm about to do now. As I considered the dress, my thoughts invariably turned toward my neck. Why? Because I try and wear a Jewish star around my neck anytime I’m in public, or private for that matter. I like publicly identifying as a Jewish person by adorning my neck with the Star of David. It’s kind of my thing. With all due respect to stylist Ali, she doesn’t always feel my Jewish star necklace “goes” with every outfit and I had a feeling the Emmys would be one of those nights that she would say my Jewish star doesn’t “go” with the outfit. In the end, Mayim and her stylist agreed upon a different Jewish symbol for Mayim to wear around her neck on Emmy night: a mezuzah. So, ok, interesting, but you're probably wondering what this has to do with me. Well, last week I made the decision to stop wearing my necklace which is made of metal (gold) and holds two things precious to me: the cross, and my wedding band. 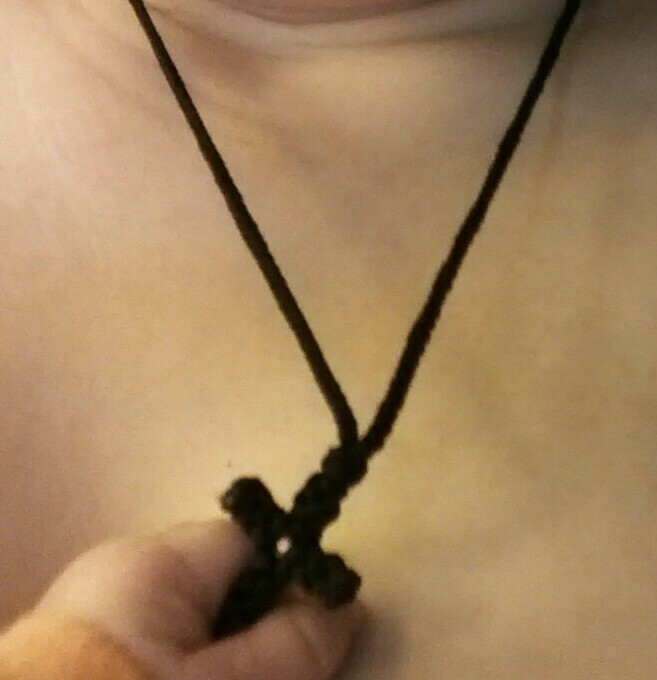 I have worn a cross around my neck ever since I became an Orthodox Christian. And my wedding band, well, that's pretty self-explanatory, but the reason it is on a chain around my neck is because my hands are still a bit swollen from water retention due to my pregnancy, and the band doesn't fit me at the moment. 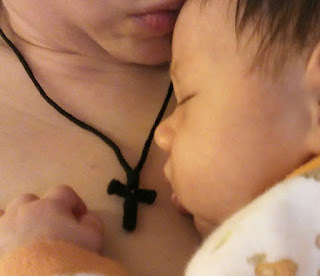 The reason I stopped wearing the necklace is because of my baby. I often hold her against my chest, and the cross is too sharp for comfort since sometimes her face smacks against me when I am hoisting her up or when she is making it clear she is hungry. 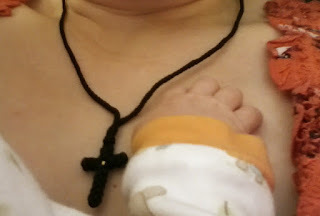 In addition, she is now grabbing at my shirt and whatever is in reach while nursing and being held (which is so adorable by the way), which means she could yank the chain and I could lose my wedding band as well as the cross. For these reasons, I have decided not to wear my metal jewelry around my neck as long as she is still nursing, which could be for a while, God willing. I am surviving with my wedding band stored away in a safe place, since I have a Claddagh ring that does fit on my left ring finger which I can wear in the meantime to signify that I am very much "taken" by my husband. But the absence of the cross, while not such a big deal for me, bothers me for the sake of my daughter. She spends so much time at my breast, and I liked the idea of her seeing and touching the cross while she is there. I want her to be familiar with it on an intimate level, as it is the symbol of our Christian faith, but I also don't want its presence to be dangerous for her, as the gold cross is since it is so sharp and could scratch her while she is snuggling against me. So, the solution? A cross made of cord instead of metal, of course! I happened to own one already that is just the right size, which I picked up at a monastery at some point over the past few years. So I went digging for it yesterday and, thankfully, found it. While it was not made to be a nursing necklace, per say, I am using it as one so my daughter knows the cross from her infancy. And while its black color and starkness is rather more ascetic than aesthetic, parenting is by far one of the most ascetic endeavors I have ever embarked upon, and so its character as such seems fitting. This is a wonderful, meaningful blog. Your little one is very lucky to have such a caring mother. Aw thank you Cindy! And I hear congratulations are in order for the arrival of your new grandchild :) God grant many years to your growing family! So sorry I missed the announcement of Rosebud!!! I was in the middle of moving and family helping days when you blogged; I had be waiting and waiting to hear not realizing I missed the other post!! Congrads!!! She is BEAUTIFUL. I thank God for your beautiful blessing!!! May she be a bundle of joy always! Thank you Elizabeth! I'm SO excited for you this upcoming week! Many years to you and your husband-to-be!! !